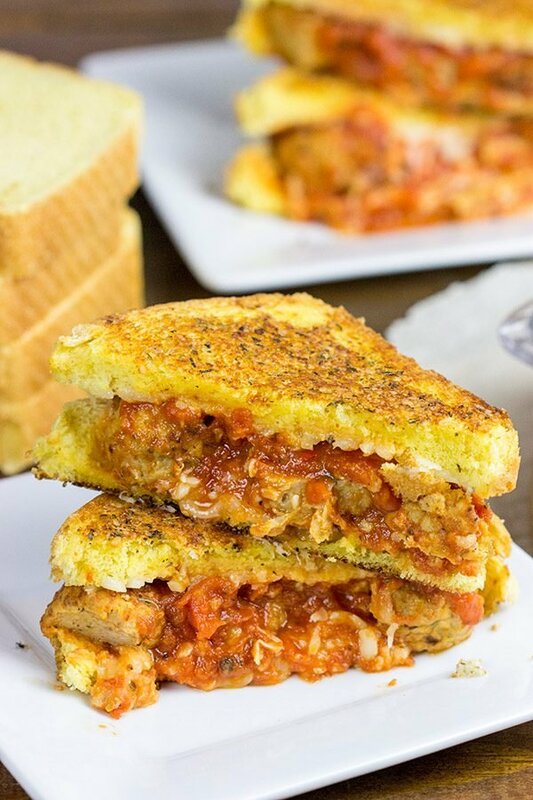 This Meatball Parm Grilled Cheese is pretty much spaghetti and meatballs…in sandwich form! I’ve always loved to read. As a young kid, my Mom said I would sit in my crib and read books for up to an hour before bed every night. (On a side note, Robbie has started doing this, and it’s amazing!) As I graduated to books with real pages, my Dad would sit and read Hardy Boys books to me every night. I loved that! I had to finish all of my homework first, but then my Dad would read a couple of chapters aloud to me before bed. By middle school, I was reading Stephen King’s The Shining…all 450 pages of it. Then for a while there, all of my reading involved endless journal articles about higher ed policy. Let me tell ya…I was happy when the time came to retire those journal articles! Finding time to read has been a bit challenging with a toddler in the house, but I’ve made a pact to get back to reading more. After the holidays, I picked up a really interesting-looking book about secret societies and their influence on world history as we know it. After a couple of pages, I was afraid this was just some whackjob guy spouting off a crazy theory. But as I read on, he kinda started making sense. Plus, the book was a NY Times bestseller, so it had some street cred! Ok. Phew. That was deep. But I also find it fascinating! I’m only part of the way into this book so far, but it’s fun to re-examine history from the point of view of secret societies. Stay tuned. Or pick up a copy and read it yourself! Let’s move on to something a bit more lighthearted. 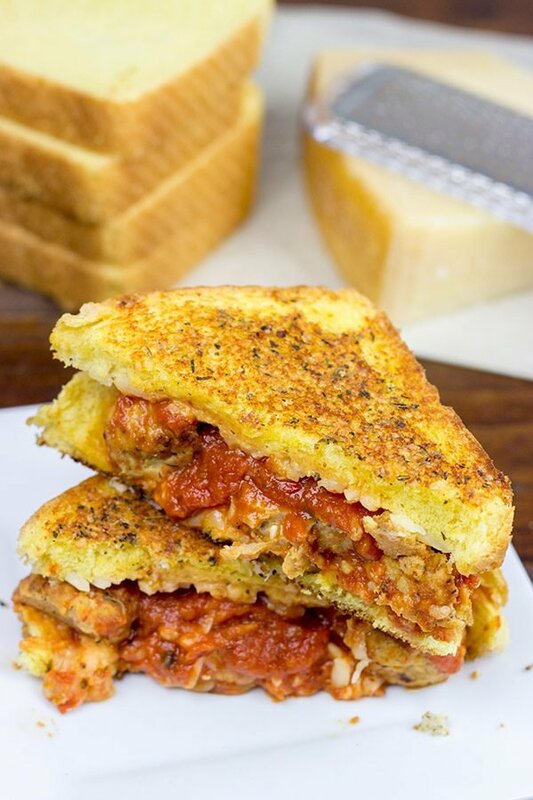 Let’s chat for a hot minute about food…and more specifically about this Meatball Parm Grilled Cheese. I do love a good chicken parm, but I decided to put a twist on the classic here. 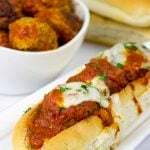 We traded in the pasta for thick-cut Texas toast, and the chicken got switched to meatballs. I’d made a huge batch of meatballs as part of this recipe for spaghetti and meatballs, and those meatballs had been staring at me every time I opened the freezer. I decided to put them to work. I decided to make a Meatball Parm Grilled Cheese. 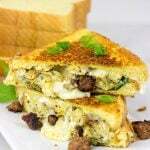 Grilled cheese sandwiches are one of those versatile recipes. You can make them as simple you’d like or as gourmet as you can imagine. You can go American cheese + butter, or you can go with a mixture of fancy cheeses and crazy toppings. At the end of the day, it’s melty cheese on buttered bread…and cheese is delicious! For this Meatball Parm Grilled Cheese, I started with Texas toast. I find Texas toast to be essential for grilled cheese. 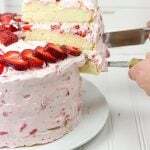 It’s a bit thicker, so it holds up well when you add extra ingredients. I also mixed some dried herbs and salt into the butter for the outside of the toast. Hint: Do this. Every grilled cheese you make from now until forever should include a pinch of dried herbs and kosher salt. Seriously! 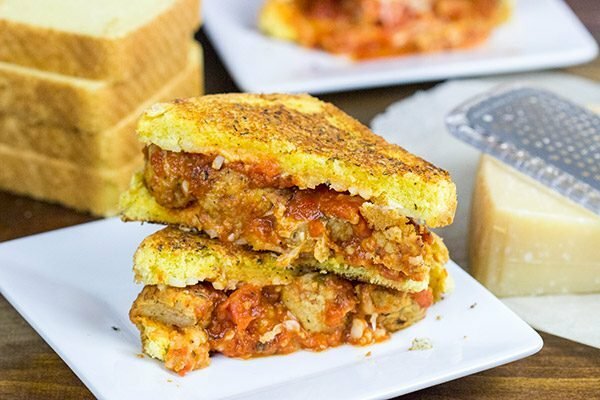 Aside from the bread itself, this Meatball Parm Grilled Cheese includes delicious (precooked) meatballs as well as a bit of marinara sauce. Add in some melty cheese, and you’ve got one heck of a delicious comfort food meal! So grab yourself a good grilled cheese…perhaps while sitting back and pondering the interaction of space and time. Cheers, friends! Preheat large griddle or skillet over medium-low heat. 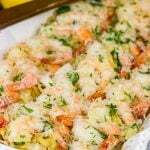 Using a small bowl, combine butter, Parmesan, Italian seasonings and salt. Butter one side of each of the slices of bread. Place two slices of bread buttered-side down. 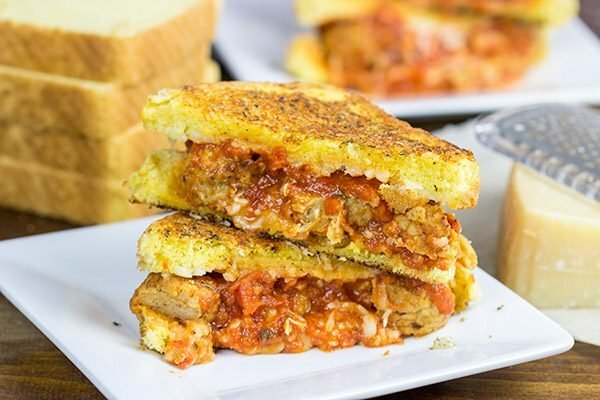 Layer grated cheese, halved meatballs and marinara sauce on top of bread. Top with remaining two slices of bread buttered-side out. Place sandwiches in skillet and cook on medium-low heat for 3-4 minutes, or until bottom slice of bread is golden brown. This grilled cheese is AWESOME, David! Cheesy goodness and the meatball addition makes it extra hearty. I’ll definitely have to add some herbs next time…don’t have to twist my arm 😉 Happy Easter, my friend. I often turn to fiction mysteries, too. They’re just such easy reads! But every once in a while I like to dabble in other stuff, too…like the history of the Roman Empire. I’m crazy like that. 🙂 Thanks so much, Dawn! I hope you and the hubby (and the pup!) had a great Easter holiday. Cheers! If I needed more proof that we’re secretly related, this post provided it. I devour books and always have. Always, since my mom stuck my first Max the Cat book under my nose and taught me to read. Did you ever get in trouble for reading at the dinner table? That was constant in my house growing up :). As for this sandwich, all I can say is YUM. Grilled cheese is pretty much my favorite meal ever. Happy Easter to you and your family, David! I think we’ve settled the question of whether we’re related long ago. I’m pretty sure you’re my long-lost sister. 🙂 Oh, I totally got in trouble for bringing books to the dinner table. In fact, I even remember my parents taking me to church on Sunday mornings…with a whole stack of books. I’d lay in the corner of the pew reading during the service. Haha! I hope you and the family had a wonderful holiday, Kelsie! Cheers, my friend! I read before bed when I was younger, but now if I read about it, I dream about it and that’s not always a good thing. I never read the Shining, but now I need to. This Grilled Cheese is ridiculous David, my mouth is watering. I wish I could jump through the screen and gobble it up right now. Yeah…dreaming about The Shining is definitely not high on my list of things to do. Sleep is at such a premium these days with Robbie in the house, so I don’t get to read as much as I used to. But I still love to pick up a good book when I can. Thanks so much for the kind words, my friend! Cheers! First, this sandwich looks ridiculous. RIDICULOUSLY AWESOME! I’m definitely pinning this for the hubbers. Second, I love to read but haven’t indulged in a good book for a minute. I’m currently enveloped with independent political articles. I need some fiction in my life ASAP. A grilled cheese is a blank canvas. Add your favorite fillings and turn it into a masterpiece! 🙂 If you’ve been reading a bunch of political articles, then you DEFINITELY need some new books in your life. Haha! You should hop back into that crazy book club if it’s still around. I mean The Pilo Family Circus sounds like a pretty f’ed up book…but then again, it fits the title of the book club, right? Anyhoo, I hope you and Kieran had a great holiday weekend, my friend! Cheers! I used to love cold spaghetti sandwiches in college. Leftovers are food too. Especially in college! Cold spaghetti sandwiches? Now that’s a new one to me, but I could see how they’d work. Although I admit that I might want to heat that sandwich up a bit. Then again, college food was no-holds-barred. If it wasn’t spoiled or growing stuff, then it was fair game. Haha! Thanks, SueAnn! Oh my gosh, I totally remember all of those required reading lists for school, too. I love to read, but I hated those required lists. Something about requiring me to read a book just takes away from it. Except for A Tale of Two Cities. I think that’s the only book I’ve ever been required to read that I actually really enjoyed. Hmmm…I like the creative thoughts about the pasta sandwich. That might be a bit hard to pull off, but we also might need to give that a shot. It could be a great one…or it could be terrible. Haha! Thanks so much, Ben! OMG Ben that sounds amazing, as does David’s Grilled Cheese Meatball Sammie !! 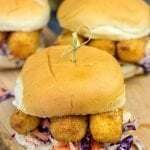 Assemble sammie and enjoy with lots of napkins on hand !!! Thanks for the great recipe ideas David & Ben !!! I loved reading to my kids when they were little too. We would sit on their bed with a stack of books each night and read before bedtime. 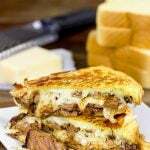 I would love to have one of these meatball parm grilled cheese, they sound wonderful. It’s really quite simple. They weren’t Earth days. Clearly. But it can get your brain all twisted up. Still, I love a good challenge…something that makes me think. Cheers, my friend! Making these tonight. Doubling the recipe and using the Texas garlic bread I’ve got in the freezer. 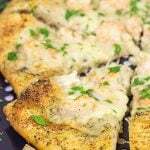 Just plan on adding the parmesan cheese in with the mozzarella! I’m sure they’ll be delicious! Hey Jo! 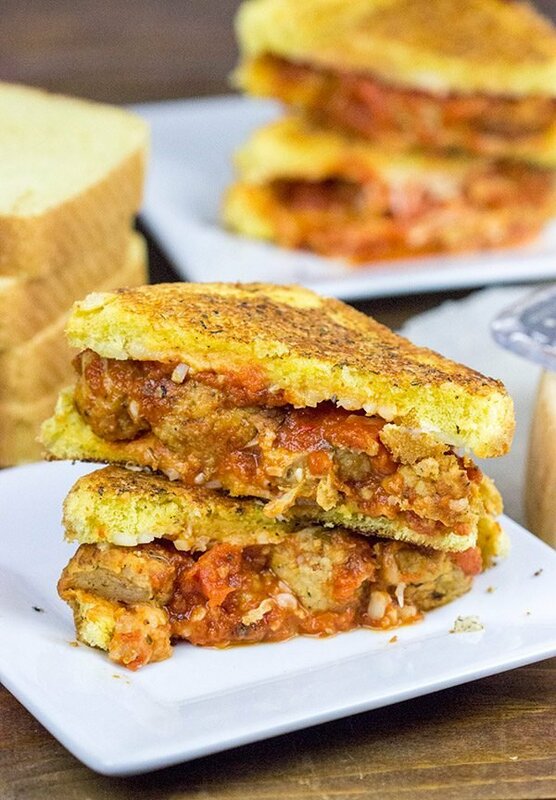 I hope you enjoyed these meatball parm grilled cheese sammiches last night! 🙂 Adding the parm in with the mozzarella would totally work, too. (Although, I have to say that you should give these a shot with the Parm in the butter on the outside of the bread. It gets all golden and crispy….mmm, so good!) I really do appreciate you stopping by and leaving a comment!